The E-type was an astonishing car when launched in 1961: astonishing looks, astonishing performance and an astonishingly low price. Enthusiastic drivers all over the world wanted one, and now, half a century after its appearance, they still do. Happily, as more and more worn-out, semi-derelict and long-forgotten examples are dragged out of garages and barns to be restored and given a new life, the stock of E-types is increasing. During its 13-year production the E-type went through countless changes, large and small, and whether you are an owner, a prospective owner, a restorer, or simply one of the many E-type enthusiasts, it is important to know what the correct original specifications and equipment would have been on the day the cars left the Browns Lane factory, both for major components like the engine and for details like the gear lever gaiter or the spark plug leads. These things matter not only because they give the satisfaction of having got things right but also because value increases with originality. This book, then, is the comprehensive guide to originality in all departments for all models of E-type. 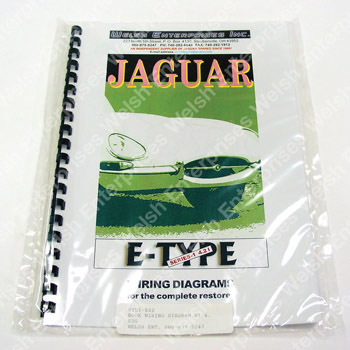 Researched and written by the Archivist of Jaguar Heritage, who has the complete factory production records in his care, it covers engine and transmission, body panels, interior and exterior trim and badges, electrics, dashboard, instruments and switches, lamps, under-bonnet components, paint and trim colours � in fact everything right down to the tool kit, from the beginning of production to the end. In the book, each model is given its own section which opens with a text description followed by specially commissioned colour photographs of outstanding examples of the cars, accompanied by extended captions. All production changes are listed, either in the text or in tables alongside. 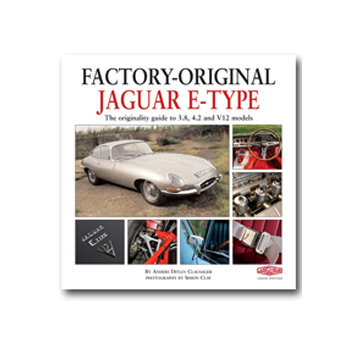 For quick reference to accurate information, this formula is hard to beat, while the book also provides a definitive history of E-type production, enabling the reader to view every model and variant in very considerable detail.